A filter basket manufactured to the same standards as a Pullman Tamper! VST baskets are precision-manufactured, highly consistent in diameter and, like a Pullman Tamper, come with their own unique serial number. 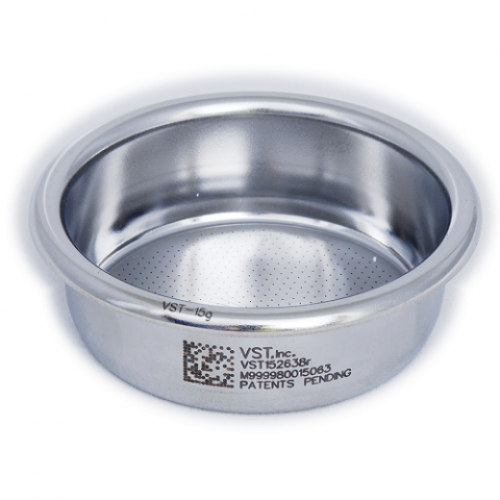 VST baskets also come with a data sheet showing a number of technical parameters pertaining to that specific basket. Please note that while every VST basket comes with a set of factory-measured parameters, the basket diameter is NOT measured by VST. However this is where our unique service stands out. We can machine a tamper base to exactly fit your VST basket. This is a 18g basket which is an oversized double basket. Ideal if you like a double shot but with a bit more richness.